Lido Bottle Works at Lido Marina Village just promoted original sous chef Amy Lebrun to executive chef. 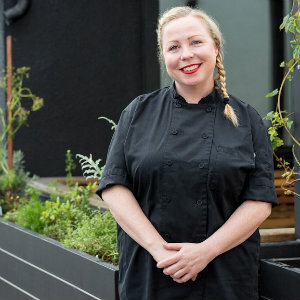 She replaced chef Joel Harrington who moved out of state to pursue new culinary opportunities. Lebrun started her culinary career in 2001 at The Ritz-Carlton in Laguna Niguel where she worked with O.C. chefs including Harrington and Dee Nguyen of Break of Dawn. Over the years Amy has had leadership roles in several high-volume and corporate venues including The Ritz Carlton in Laguna Niguel; The Resort at Pelican Hill; 24-Carrots and Wyndham Avenue of the Arts. Her culinary flourish is most evident in the restaurant’s popular Weekend Brunch Menu, which she created, and the Daily Specials: tacos with handmade tortillas; made-from-scratch soups; and the locally-sourced Dory Catch, which she shops for almost daily in the early morning at the Dory Fishing Fleet on the Newport Peninsula. The menu at Lido Bottle Works will continue to evolve through the seasons, Chef Amy said, but the most popular items remain available. Favorites from the tapas-style menu include the Goat Cheese Fritter with ancho cajeta and red pepper aioli; Cauliflower with trumpet mushroom and golden raisin; Salmon Belly with bacon, clam and dill gel; and the Tuna Tartare with avocado and chili pop rocks. You also don’t want to miss the LBW Burger with bacon jam, black garlic aioli, and wasabi brioche. For extensive information about Lido Bottle Works partners, bar program and more, visit http://bit.ly/LBWmoreinfo. Open for lunch 11 a.m. to 4 p.m.; dinner 4 to 10 p.m.; weekend brunch 10 a.m. to 3 p.m.
Lido Bottle Works is at Lido Marina Village, 3408 Via Oporto in Newport Beach. 949.529.2784.